First American edition of the author’s magnum opus. Small octavo, 3 volumes, contemporary calf, rebacked. In near fine condition. From the library of Malcolm Forbes. Housed in a custom half morocco clamshell box. 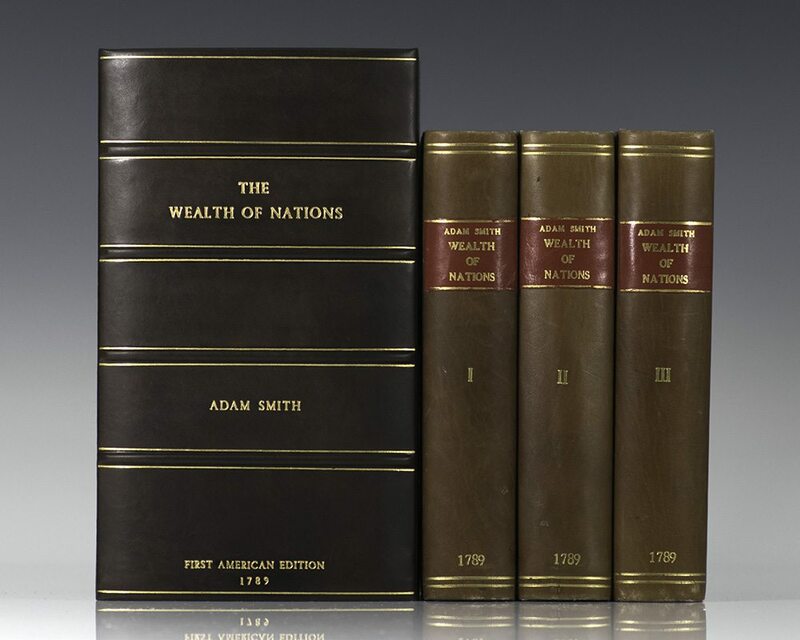 First published in 1776, Adam Smith's masterpiece The Wealth of Nations, is the foundation of modern economic thought and remains the single most important account of the rise of, and the principles behind, modern capitalism. It took Smith ten years to produce An Inquiry into the Wealth of Nations. His commentary during such an incremental time, the first years of the Industrial Revolution, sought to reform outdated theories of mercantilist and physiocratic economic thought with broader concepts that we are all familiar with today, such as the division of labor, productivity, and free markets. An important theme that persists throughout the work is the idea that the economic system is automatic, and, when left with substantial freedom, able to regulate itself. This is often referred to as the "invisible hand." The ability to self-regulate and to ensure maximum efficiency, however, is limited by a number of external forces and "privileges" extended to certain members of the economy at the expense of others. 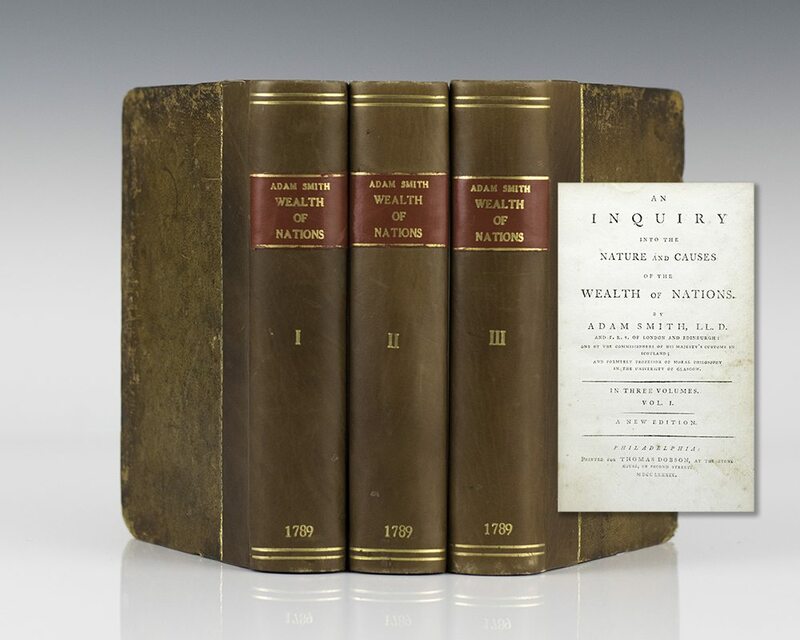 The 1776 publication of An Inquiry into The Wealth of Nations was the first of only five editions that were published in Adam Smith's lifetime and greatly influenced a number of economists and philosophers of his time and those that followed, including Jean-Baptiste Say, Alexander Hamilton, Thomas Malthus, and Ludwig von Mises. "The history of economic theory up to the end of the nineteenth century consists of two parts: the mercantilist phase which was based not so much on a doctrine as on a system of practice which grew out of social conditions; and the second phase which saw the development of the theory that the individual had the right to be unimpeded in the exercise of economic activity. While it cannot be said that Smith invented the latter theory.his work is the first major expression of it. He begins with the thought that labour is the source from which a nation derives what is necessary to it. The improvement of the division of labour is the measure of productivity and in it lies the human propensity to barter and exchange.Labour represents the three essential elements-wages, profit and rent-and these three also constitute income. From the working of the economy, Smith passes to its matter -'stock'- which encompasses all that man owns either for his own consumption or for the return which it brings him. The Wealth of Nations ends with a history of economic development, a definitive onslaught on the mercantile system, and some prophetic speculations on the limits of economic control.The Wealth of Nations is not a system, but as a provisional analysis it is complete convincing. The certainty of its criticism and its grasp of human nature have made it the first and greatest classic of modern economic thought" (PMM). London: Printed for A. Strahan; and T. Cadell jun. and W. Davies, 1799. 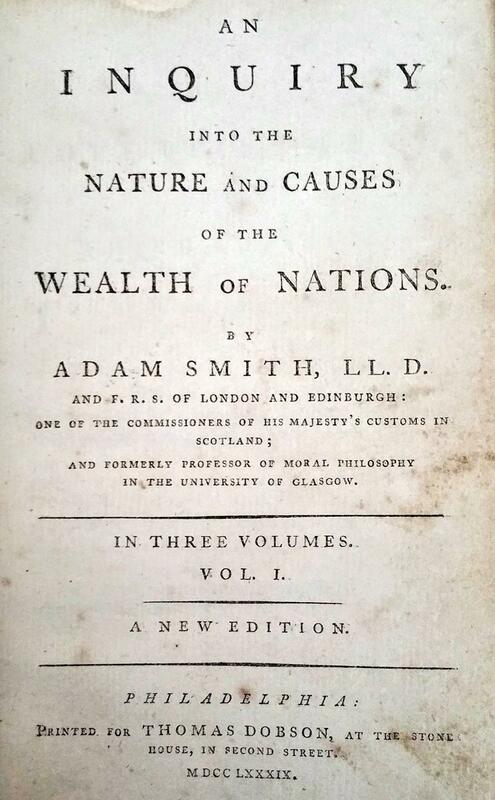 Early edition of Adam Smith’s magnum opus and cornerstone of economic thought. Octavo, 3 volumes. Bound in full contemporary tree calf, morocco spine label, marbled endpapers. In near fine condition, with the text clean, From the library of explorer and parliamentarian Alexander Forrest with his nameplate to the pastedown. An exceptional set of this classic work. New York: Summit Books, 1981. First edition. Octavo, original half cloth. Inscribed and dated by the author on the half title page. Light foxing to the page edges, near fine in a near fine with a few closed tears. Smith, Adam; Introduction by Paul A. Samuelson. First easton press edition. Octavo, original full leather, with raised bands and titles to the spine and front panel in gilt, all edges gilt. Signed by Nobel Prize-winning economist Paul A. Samuelson on the title page. Samuelson contributed the introduction to this volume. In fine condition.